How much does it cost, to build a house in the Philippines and is it possible to build a rather cheap house? If you want to build a house in the Philippines you will usually ask a constructor to do all the necessary arrangements and logistics for you such the drawing, building permit and the construction itself of course. If it comes to cost of building a house in the Philippines you will always her the same price: about 20.000 Peso per sqm. This price should include all material, including the roof, tiles and the bathroom equipment. However for 20.000 Peso per sqm you should already expect some good quality building material and not the cheapest available. Comparing this price to the cost of building in european countries this might sound cheap and so foreigners tend to build big houses. But don't forget that big houses also require a lot of work and maintenance over the years. Even for a small house of lets say 6 x 8 meters (48m²) you will end up at about 1 Million Peso or about 20 000 Euro. There are some people who might not have that amount of money so the question comes up if it would be possible, to build a house for less? Yes you can! If you buy all the material by yourself and hire independant carpenters from the neigbourhood, you should be able to do it for about half of that price (about 10 000 Peso per m²). It will cost you some nerves, however. 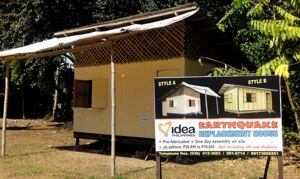 After the earthquake on Bohol Island in October 2013, there where companies which offered kind of prefabricated small houses, set up in a couple of days, starting at only 28.850 Peso. 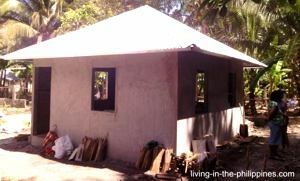 This was more a hut than a house but the ones that cost a 'bit more like 80 000 or 100 000 Peso looked quite nice already. Also after the earthquake which destroyed many houses on Bohol, affected people received free material from the government to build small houses for themself with a (thin) steel frame, walls from woven bamboo covered with cement and a steel roof. However, even if you had to buy that material, I think the whole house would cost not more than 100.000 Peso (2000 Euro) or so.